New and bloodthirsty label Unspeakable Axe Records has joined forces with crossover thrashers Birth A.D. to bring you the group's first full-length, "I Blame You." Birth A.D. have been terrorizing their home state of Texas since 2008, dropped a tactical nuke of an EP ("Stillbirth of a Nation") in 2009, and are now ready to leave the entire USA just a smoking crater with this anticipated debut. Full of punk attitude, thrash precision, and a whole lot of yelling, this CD is the rightful heir to great bands like D.R.I. and S.O.D., and gives exactly as much of a damn about what you think as those bands did. Birth A.D. is a well-oiled machine full of seasoned pros who have played live and in studio with many well-known bands, and with famed thrash producer Alex Perialas behind the boards, they sound as assured as you'd expect given their formidable credentials. This is the first release of Unspeakable Axe, a sub-label of the mighty Dark Descent, whose roster of death, doom and black metal has made it internationally known in just a few short years. Unspeakable Axe will complement their parent label with a more thrash-oriented approach that hearkens back to the roots of extreme metal, and to the fluid transitions between the various sub-genres in their infant forms, before battle lines were drawn and rules were written and expected to be followed. The band has this to say: "Joining forces with Unspeakable Axe and Dark Descent proved to be the best choice for Birth AD, as they are about the bands, the music, and doing things the old way (that is, the right way). We plan to cause even more problems with their support!" "I Blame You" is expected to arrive in late spring/early summer 2013. Last edited by dalecooper on Wed Oct 12, 2016 10:02 am, edited 25 times in total. Really hating the vocals... sorry. No worries! I like it personally, seems like classic crossover tuneless yelling to me. Definitely more punk than metal in style. Understood. Hopefully you'll be more into whatever I release next... talking to somebody already but I don't want to give it away until it's a done deal. Nice, I might submit something if I think it fits your roster. Absolutely dude, I hope you do! Unspeakable Axe Records is proud to announce that we will be reissuing Besieged's self-released album, "Victims Beyond All Help." Besieged have been terrorizing music listeners in their hometown of Winnipeg for quite some time, putting out a demo ("Visions of Pain") in 2004 and then releasing their debut in 2010. Their sound is lightning-fast death-tinged thrash metal, indebted to the old gods of the scene while also bringing in new influences and ideas. No jokey lyrics, no phony retro affectations, just pure bludgeoning for fans of "Beneath the Remains," "Reign in Blood," "Darkness Descends," and other uncompromising, furious albums that changed the face of the genre. "Victims" was self-released by the band in 2010 and limited to just 300 copies on pro CD-R; now it will be officially reissued with an upgraded layout, and the "Visions of Pain" demo tracks as a bonus. This reissue will use the same completely old school artwork painted by the legendary Ed Repka. This will be the second release by Unspeakable Axe, the new sub-label of Dark Descent Records. "Victims Beyond All Help" is due for release in spring or summer of 2013. In what is getting to be our typical fashion, here's an informal announcement in advance of the official announcement. Unspeakable Axe has signed on vicious thugs of death metal TRENCHROT. Their three-song demo is streaming at this location: http://trenchrotdeathmetal.bandcamp.com/ Go listen to the semi-Asphyxian, sortaSwedishy death metal goodness. TrenchRot is in the writing process for their full-length, which will be recorded this summer for a probable fall release. Hail are you interested in trade for items? I have a small lable called Arcane metala rts and ahve a few items. Unfortunately not, I'm not a distro so personally I'm only doing wholesale - but Dark Descent has the CD for trade, as well as retail/wholesale. I got to hear the Birth A.D. LP the other day and I must say, this thing rips! One of my favorite albums of the year so far. I know Birth A.D. and Evil Army are playing a show in Baltimore early next month. I'm not sure if I'll be able to go, but if I can get some plans in order, I can try to promote the gig/band on my new radio show. Awesome job with this one, Birth A.D. and Unspeakable Axe! Keep it up! Thanks Tonyr, glad you liked it! First reviews of "I Blame You" are starting to appear - this one from Queens of Steel gives it a 9/10: http://www.queensofsteel.com/2013/03/bi ... blame-you/ In Spanish but a quick spin through Babefish tells me they have nice things to say. AVAILABLE NOW! Birth A.D. - I Blame You. Retail and wholesale available at http://www.darkdescentrecords.com. Wholesale also available at https://www.facebook.com/UnspeakableAxeRecords, or send me a PM or e-mail (unspeakableaxerecords AT gmail.com). Killer stuff. Looking forward to that Birth A.D.! 3. Got a YouTube channel where all upcoming releases will be previewed: http://www.youtube.com/user/UnspeakableAxeRecs/videos Three videos posted there so far, one for Birth A.D. and two for Besieged. Once mastering is done on Angelcrust I'll have a track or two for them too. 4. As for releases, Besieged is now available, and Birth A.D. is still hot. Up next: a 7" from black metal/powerviolence act Angelcrust. 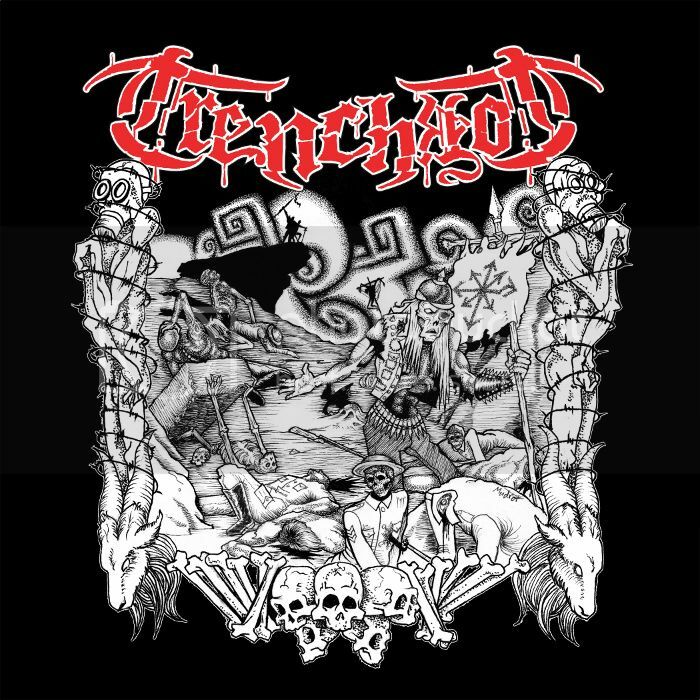 The debut full-length of old school death metal band Trench Rot. The follow-up to "Death After Death" from US death/thrash pioneers and legends, Insanity. More to be announced once deals are finalized. - We have new signings. Omnivore from Italy play - or rather played, as they are now split up - high-speed death thrash with insane riffing. So, right up my alley. We'll release the album they had recorded prior to breaking up. Here's a track. - Also, Algebra from Switzerland are hard at work on their sophomore full-length after the well-received "Polymorph." No-nonsense thrash metal with nods to various masters of the genre and their own approach layered on top. Here's the title track from "Polymorph." - We will release a compilation of all recorded material to date (plus hopefully a new bonus track or two) from the inheritors to the throne of Demoltion Hammer, Laceration. This is their most recent material from a split with Tinnitus. - And last from the new signings, Morgengrau from Austin, TX play old school, Euro-style death metal - think Pestilence, Asphyx and you're in the neighborhood. They self-released their debut in 2013 and we'll release their follow-up album in summer 2014. Here's a song from "Extrinsic Pathway." - Other updates: Sewercide/Presumed Dead split 7" will be out around the end of the year. So will LPs of Birth AD and Besieged. The Trench Rot CD was slightly delayed due to scheduling conflicts with the studio, but they're almost done recording now and the artwork is being finalized as well. Angelcrust 7" was delayed massively due to problems with the mix - the guy doing it has been replaced and hopefully that will be resolved soon. Finally, Insanity is currently tracking the new album and on pace to deliver it by early next year as hoped. On December 2 at 1 PM EST, the Unspeakable Contest begins, and one day later it ends. You'll be asked to identify some songs from short snippets (10-15 seconds) and answer some trivia questions about metal. No more details than that until the day arrives. Top three get prizes - 3rd place gets their choice of a CD, LP, 7" or Besieged shirt; 2nd place gets their choice from the above plus a test pressing of Sewercide/Presumed Dead as well; and 1st gets two choices plus a test pressing. We'll be looking for highest scoring total on the quiz, with ties resolved by who submitted their answers first. Prizes will go out after our upcoming releases are in stock (including Sewercide/Presumed Dead, Besieged and Birth AD LPs, and hopefully the Trench Rot CD as well), so you'll be able to pick from a slightly larger inventory than I've got right now. Spread the word if you're so inclined, and keep an eye on this page. 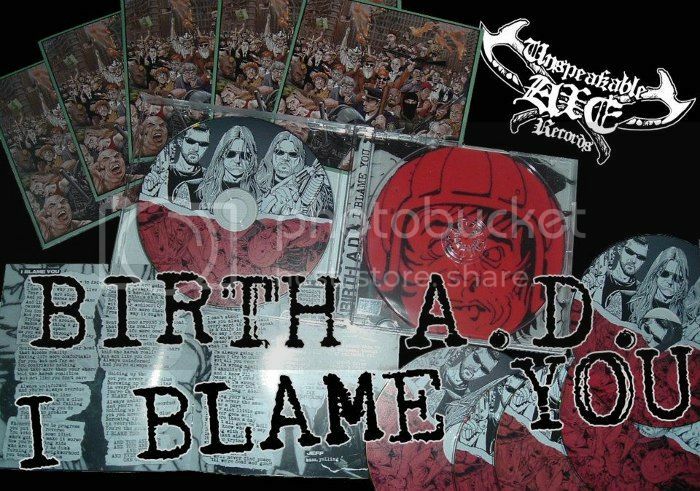 1) Birth A.D. "I Blame You" on black or green splatter vinyl. 2) Besieged "Victims..." on black or yellow/red splatter vinyl. 3) TrenchRot "Necronomic Warfare" CD. Birth A.D. LP comes with a poster as well. Please note, splatter on both LPs is very limited - first come, first served. According to the MA entry for the Birth AD album, there's a tape version. I can't find it anywhere, are you or DDR going to have copies of it any time soon? It's super-limited (100 copies I think) and only the band and the label that released it are selling them, that I know of. Some updates - Omnivore and TrenchRot CDs are in stock with me and in the Dark Descent distro, and will begin trickling out to the rest of the planet in February. Besieged and Birth A.D. vinyl is supposed to ship to me next week. Both come with a printed innersleeve and are available in either black or limited splatter - the Besieged red/yellow is going quick. Birth AD also comes with a cool B&W poster. Next up: debut albums from Sabbatory (death metal out of Winnipeg) and new signees Shards of Humanity (Memphis thrash with death and technical aspects to it; reminds me at times of early-to-mid Death). Good news about Zoldier Noiz, I thought they had split up. Good stuff ! - Upcoming releases: Shards of Humanity (Memphis-based death/thrash with a technical edge) and Algebra (Finnish thrash) are both done with their albums; look for an early summer release on both. After that in some order will be releases from Overcharge (punk/speed metal from Italy), Insanity (needs no explanation), and Morgengrau (OSDM from Texas). And you can also subscribe to our mailing list - just email me. unspeakableaxerecords AT gmail.com. I send a mass mail about once a month with just the important stuff that's going on. Now in stock - our first official label shirt. These are front and back printed with soft-feeling water-based ink on heavy white Gildan Ultras. Original art design on the front, label logo on the back. All CDs $8 or less, t-shirts $8, LPs $12, and digital album downloads under $5. Our Bandcamp promotion ends tonight at midnight. Last chance for a while to snag our releases at these great prices! - Two new CDs are in stock and shipping starting tomorrow. Shards of Humanity's debut album is full of somewhat technical death/thrash with lots of good 80s and 90s influences - Death, Cancer, Sadus, Massacra, Insanity, and others. It's aggressive and well-written stuff with interesting philosophical lyrics that any fan of classic death metal and death/thrash should like. Algebra's 2nd album meanwhile is more squarely in the Bay Area style of thrash with tight lead playing and distinctive themes. A solid development from their debut which was reissued by Stormspell last year. Dark Descent will have both of these titles in stock this week, too. - Overcharge's debut album of punk/speed metal is done - music, art, layout and all - and will go to press before summer is over. Fans of Disfear, Motorhead, and so on should enjoy this a lot. - Insanity's long, LONG-awaited 2nd album "Visions of Apocalypse" is on the closing stretch recording-wise, and we recently unveiled the artwork by Danille Gauvin. That's expected to go to press in the fall, with Dark Descent handling an LP release at the same time. - Recent signing: Bay Area semi-melodic death/thrashers Hemotoxin are a breath of fresh air in what can sometimes be a stale, predictable style. Their recent self-released EP "Alchemist" is a dazzler and will be included as a bonus with the upcoming 2nd album released by UAR. Beginning next week we're going to do something different until the end of the summer. Each week there will be one or two titles on sale for half price*. No kidding. $5 will get you... some CD by some band. I'll let you know each Monday. And for the duration of summer I'm also offering deep discounted wholesale rates as well, on orders of at least 20 (mixed or single title). If you run a distro, drop me a line - or if your distro of choice doesn't stock our stuff, drop THEM a line and tell them to contact me for a killer deal. Now through the last day of August. * We'll be doing CDs for half price. Vinyl and merch may be discounted as well; if so those will probably be 1/3 off, not half.